From a layman climatologist and sailor’s perspective, I can state that when we have a week of westerlies in March in the Eastern Caribbean with monster swells turning perfectly good historic anchorages into nightly nervous sleepless anchor watches – global warming must be on! – In my humble opinion. While at Sint Maarten the guys were doing their STCW, VHF licenses ashore at the Maritime School of the West Indies and RUTH anticipated a quiet week except that it was not quiet for long. The westerlies kept building and then enough was enough, the swells had become waves and around 1730 we left our Big Bertha anchor ( a 150Kg Rocna with 50 fathoms of chain) attached to an identifying fender marker outside Marigot Bay and simply started sailing up and down the Anguilla/Saint Martin channel all night and most of the next day. By the afternoon it started to calm down and we went into a southern corner of Simpson Bay and dropped our brand new second hand CQR 85Kg anchor on an 80m warp. The following morning it had all settled and we picked up and got back onto our Big Bertha waiting patiently for us on the bottom of Marigot Bay. Classes had been postponed in the interim and the guys got straight back to class the next day. That’s when I got a nervous call for help from the only crew aboard Swiss tallship “Salomon” which had remained in Simpson Bay. Her Captain had been relieved and recalled and her watchkeeper was alone and the vessel was dragging anchor and veering close to the beach. Of course, we would help! Getting over there ASAP, we had to jump start her engine and get her anchor up. Soon we were motoring nicely past the megayachts and around to Marigot Bay where I organized to drop her anchor in good water about 200m away from RUTH. Later, in Marigot I met Captain Ruth from the Netherlands on leave from “Wylde Swan”. 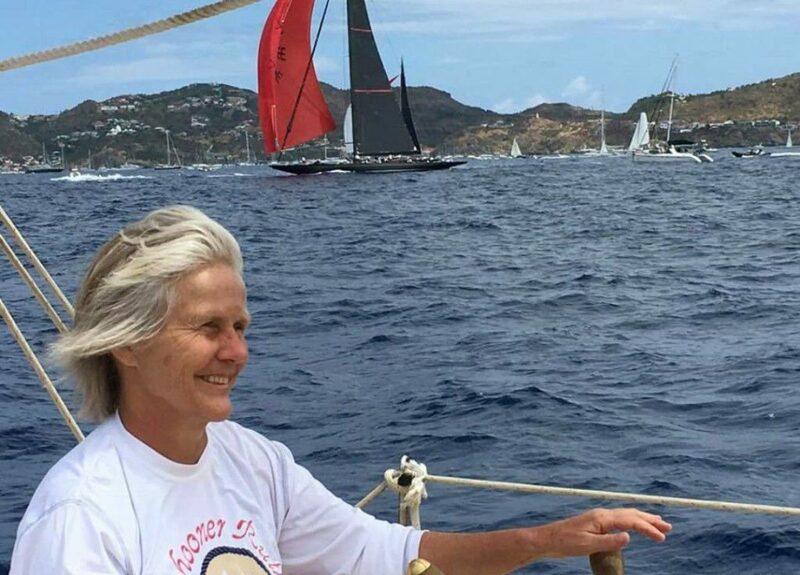 She wanted to sail with us to Saint Barts to observe the super sailing mega yachts and J’s at their Bucket Regatta and onward to Barbados.. Ruth on RUTH! 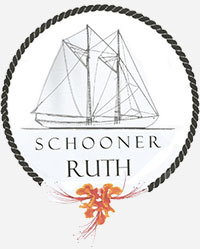 Captain Ruth and her friend Canadian ships Doctor Dee from New Brunswick came sailing and I think enjoyed the pure sailing machine that is RUTH. In Saint Barts we were joined by the owner Mr. Dash and his two guests Liz from Montreal and frequent RUTH crew member Faye from Barbados. During the Bucket Regatta race days we shadowed the fleet from the starting line mainly watching the 3 J class vessels. We could only shadow as entry fees for the Bucket start at USD 5000 and other entry requirements are quite a burden. 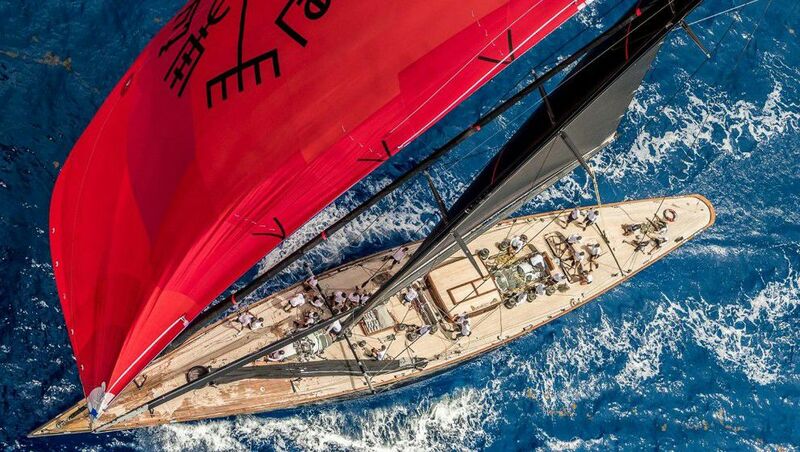 The J’s had their own Megayacht support vessels … think about that, plus their own helicopter taking off from the Megayacht to film the occasion which are always historic – when those yacht racing widows ofthe last century congregate to compete! Leaving Saint Barts for Barbados we got a little respite from the hard beat by some ENE wind and during some low winds we put up the Fisherman to keep us above 4knots so we did not have to motorsail. 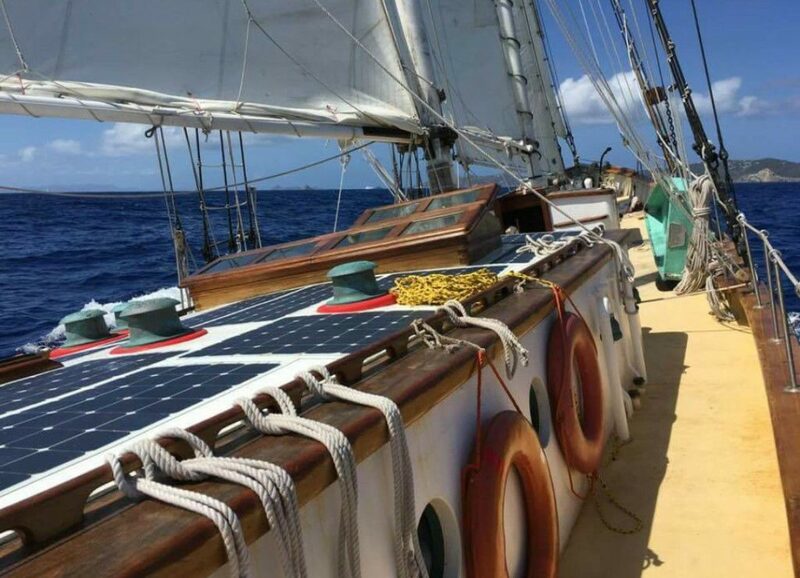 We arived in the shallow draft in Bridgetown in the wee hours of the night and slept blissfully, but Doctor Dee was up at dawn ready with a list of rig maintenance items she wanted to tackle, but that’s for the next post.